Easy pumpkin porridge recipe. 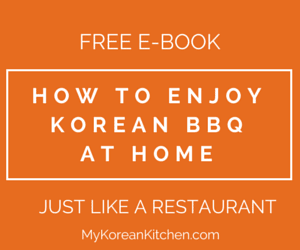 Learn how to make Korean style pumpkin porridge! Korean pumpkin porridge (Hobakjuk, 호박죽) is a popular snack / dessert, but some people even eat it for breakfast too. It’s sweet, nutty and velvety. A perfect comfort food in fall and winter! 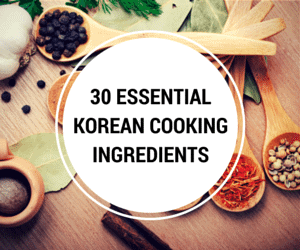 The Korean word – Hobak (호박) is a generic term for pumpkin, squash (US) and zucchini. But when we refer to Hobakjuk (호박죽), it is usually made with danhobak (단호박), which is known as kabocha squash, Japanese pumpkin, and Kent pumpkin in some English speaking countries. 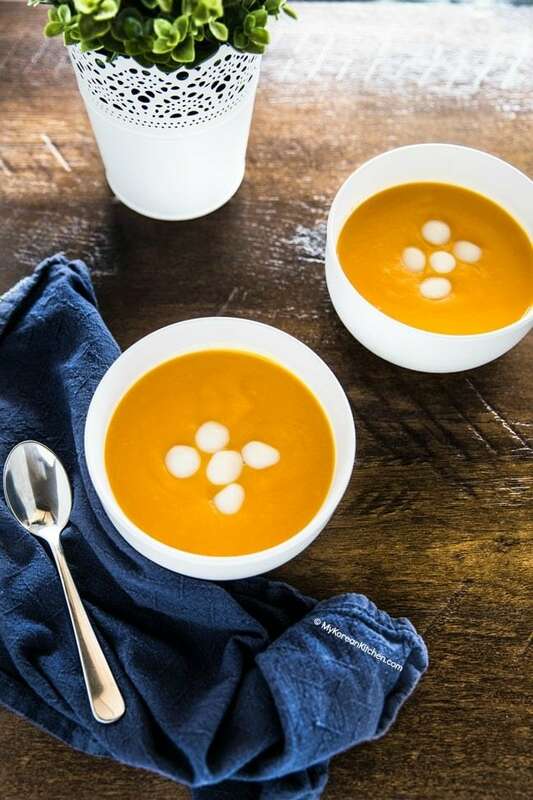 Among other benefits, pumpkin porridge is known for reducing swelling after surgery in Korea. So it’s a popular get well gift. 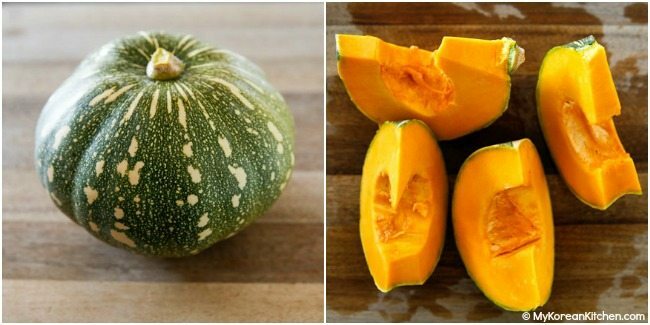 The porridge is often seasoned with sugar, but as kabocha squash is naturally sweet, you can reduce it or even skip it per your preference. 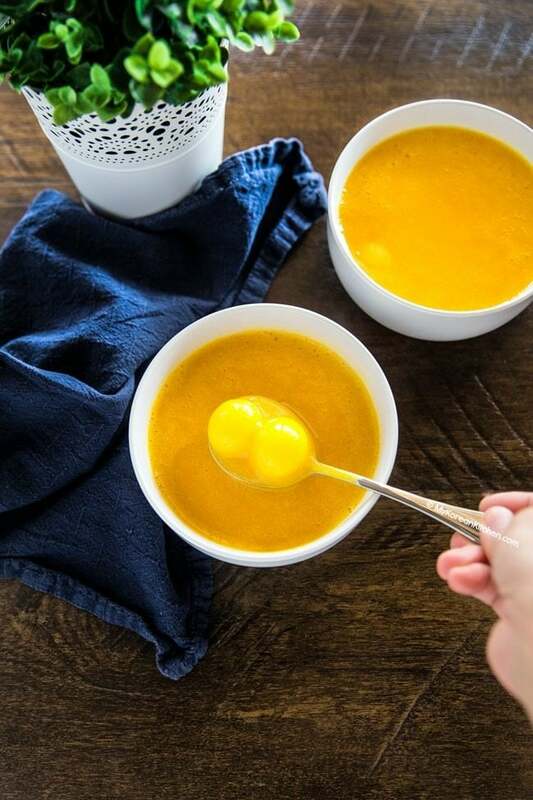 Korean pumpkin porridge has a velvety smooth texture so it is a popular baby food as well. 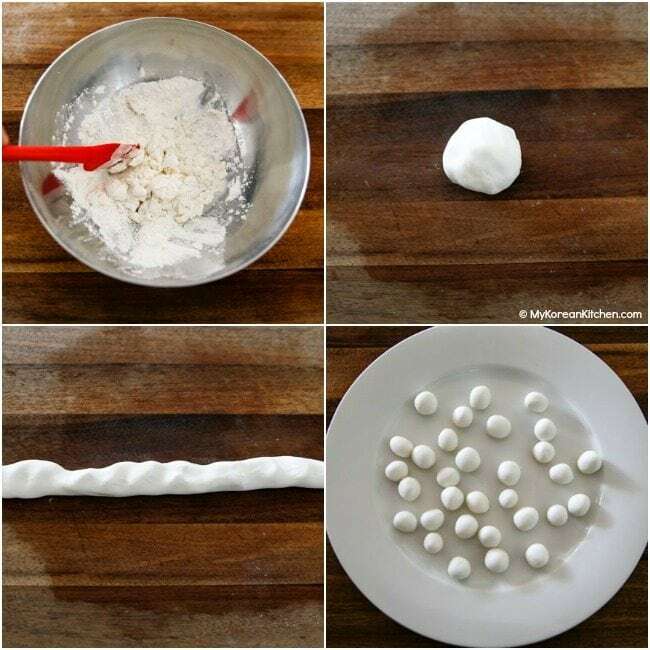 But if I were using this recipe for a baby, I would omit the sugar, salt and the rice cake balls. Alternatively, you can use this recipe that I used for my daughter. It was one of her favorite baby foods back in the days. Another highlight of Korean pumpkin porridge is rice cake balls. (Some people might call it rice dumplings). These balls are made with sweet rice flour (mochiko) and its jelly like texture is quite fun to eat with the porridge. My sister reckons it’s the best part! Interestingly, these rice cake balls are called Saealsim (새알심) in Korea. That means bird’s egg. It’s probably named like this because they look like small bird’s eggs. Depending on how you use these balls, they can be used to thicken your porridge, but I mainly use them as a garnish and use additional portions of sweet rice flour to thicken the porridge. Now that all the basics are covered, let’s get cooking! Hope you enjoy my recipe! 1. Cut the pumpkin (kabocha squash) into quadrants. Remove the seeds and stringy bits with a knife and/or spoon. 2. Place the pumpkin into a steamer and steam them over rolling boiling water until the pumpkin is tender and soft. Cool down the pumpkin until it’s easy to handle. Cut the skin off from the flesh and discard. Chop the pumpkin into smaller chunks. 3. Place the pumpkin, water (3 cups), sugar and the salt into a blender. 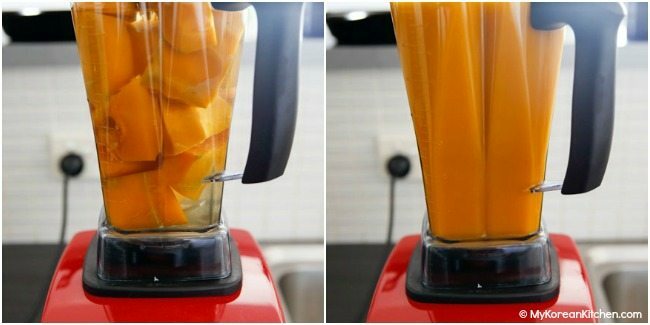 Blend it until pureed. 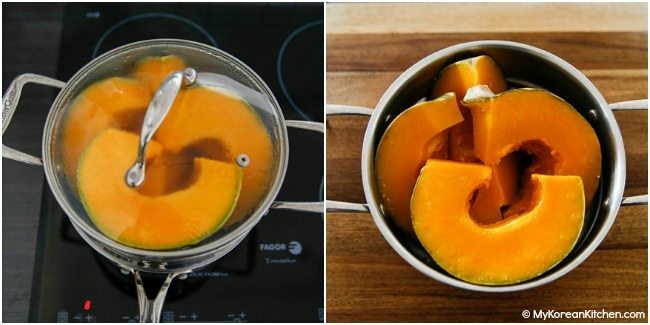 Pour the liquefied pumpkin into a medium size saucepan and boil it over medium high heat for 10 mins. Stir it often to avoid it burning. The porridge can be served warm or cold. The unused portion can be refrigerated for a few days or frozen for a month. It reheats well in a microwave but make sure you cover with a microwaveable lid to avoid a messy clean up afterwards. 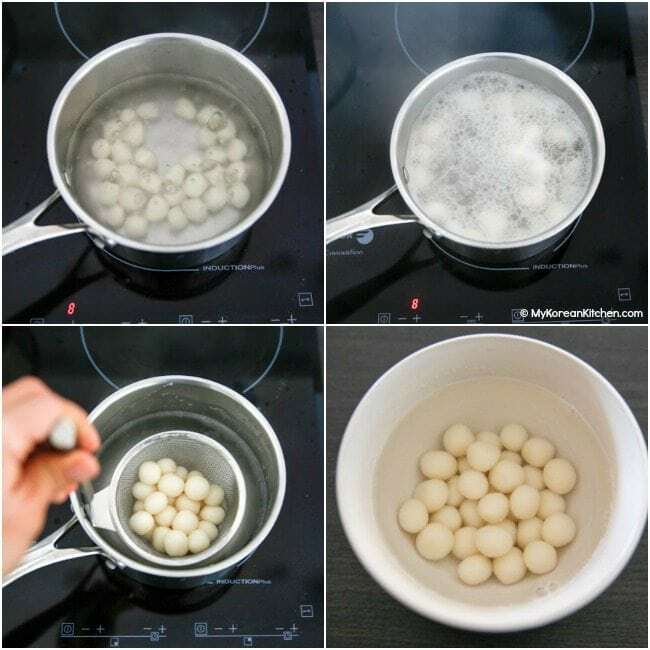 Scoop out the rice cake balls using a strainer then transfer them into a bowl with (cold) water then set it aside until needed. 3. Garnish on the pumpkin porridge. Cut the pumpkin (kabocha squash) into quadrants. Remove the seeds and stringy bits with a knife and/or spoon. 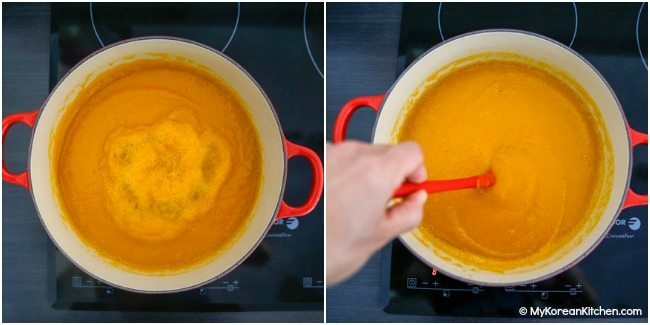 Place the pumpkin into a steamer and steam them over rolling boiling water until the pumpkin is tender and soft. Cool down the pumpkin until it’s easy to handle. Cut the skin off from the flesh and discard. Chop the pumpkin into smaller chunks. Place the pumpkin, water (3 cups), sugar and the salt into a blender. Blend it until pureed. Pour the liquefied pumpkin into a medium size saucepan and boil it over medium high heat for 10 mins. Stir it often to avoid it burning. Garnish on the pumpkin porridge. Excellent recipe! Made it tonight – it was easy to follow and delicious. Thank you for sharing! Hi Sue, I made it last night – Simple and Awesome!Thanks for the recipe. Hi Sue, thanks for the recipe it looks delicious would love to make it . I live in Barbados and I would have to check around for to see if I can get the sweet rice flour here in my country. If i find it I’ll let you know how it turned out. Thank you so much for this recipe. I had this in Korea last year and really wanted it again. I wanted to make my own and was looking at recipes online. Nothing appealed to me and they seemed complicated. Then your email came and you always make recipes seem so simple. I will be trying it this weekend. If all goes well, I will be making more and freezing batches. I got my squash last night and plan on making this this weekend. I was just saying that I wanted to make this and then got your email. I had this in Korea last year and it was so so good. It is perfect for this season. I plan on making this and if all goes well I will make more and freeze batches. I always roast pumpkin or squash before proceeding with any recipe. Roasting enhances the flavor of any of the vegetables prior to soup making. When I roast the butternut squash in the oven(skin on)I usually rub the skin with vegetable oil, remove the seeds, and put it on a sheet or roasting pan, skin side down, and cover it so that it doesn’t dry out. You have to check it from time to time, using a fork or chopstick to test for doneness. If you leave it in too long, the juices will start to caramelize and burn. That’s the sugar coming out. You don’t want to burn that sugar. Roasting is good for 2 reasons: with the pumpkin covered, the dry heat will cause the pumpkin to roast in its own moisture and there is less danger of the flesh becoming becoming too wet as when it is boiled. That way you have more control over how much water or soup stock(preferred) to add. If. 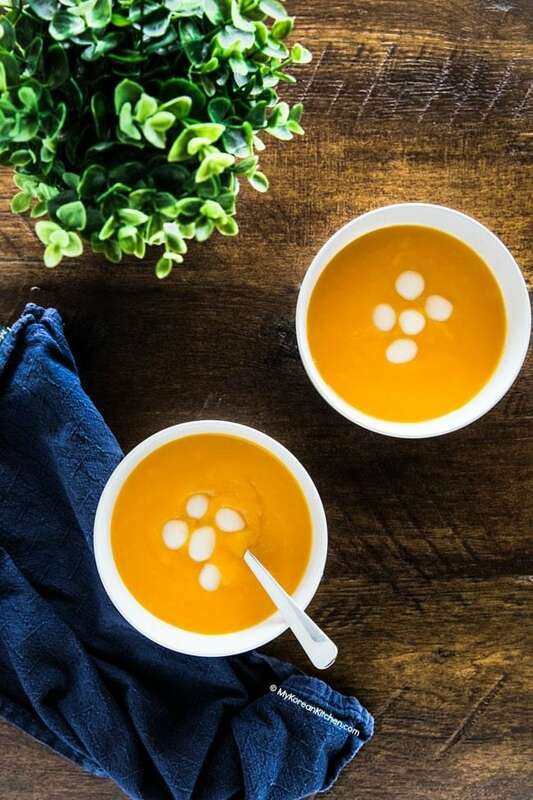 When you add half and half or heavy cream to give the soup a smoother, more velvety texture, you won’t have excess moisture that you might get when boiling in water which might dillute the natural flavor. I’m not sure if it makes a difference whether you purée the pumpkin flesh before or after adding the cream. The second reason to roast the squash, skin-on, is that the flesh can be easily scooped out with virtually no waste. Hint: if you try this method, try scraping the pan where the flesh has started to caramelize around the edges. It’s like eating candy. 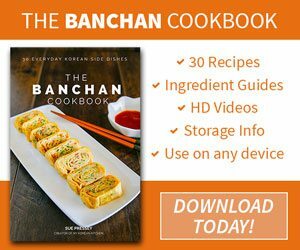 BTW: I will definitely make a kabocha porridge as a side dish to our Thanksgiving dinner this year with the rice cake balls and several other side dishes several Korean side dishes using your banchan recipes,. Thanks for the porridge recipe. Our local Korean Market sells acontainers of pumpkin porridge daily in their ready-to-eat section. 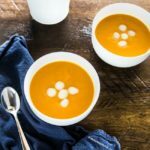 I regularly make a variety of soup recipes, including roasted, puréed butternut squash or kabocha soup. Roasting brings out more of the natural sugar, so I add less sugar. I add a couple of cloves of pressed garlic, a tiny bit of nutmeg, and use canned chicken broth instead of water. For richness I add about a quarter cup of heavy cream, topped with toasted pumpkin seeds, sour cream, and cilantro. Your post provides me with the crowning touch, the rice cake balls. I will try to make them this week. The result for me will be a main course entree. Thanks again for sharing. Hi Michael, I didn’t know roasting brings out more natural sweet taste of the pumpkin. Maybe next time I can try that. I bet it’s nuttier too. Anyway, enjoy my recipe!